The Division of Student Affairs supports the academic mission of Hampton University by providing services which assist students in identifying, clarifying, and achieving their educational goals. In addition to direct assistance to students, the Division is charged with developing programming which enhances the learning environment on campus and improves the quality of life for students and others. Central to this charge are activities which promote and sustain an appreciation for the uniqueness of Hampton University; respect and appreciation of the multicultural backgrounds represented on the campus; the investigation of contemporary issues concerning the well-being and life choices of students; and a campus environment which encourages a productive interchange of ideas. Located in the Wigwam Building, the Career Counseling and Planning Center provides information and centralized service regarding employment and other opportunities in business, industry, hospitals, public school systems, graduate schools and federal, state, and local government. The purpose of the Dean of Men and the Dean of Women is to provide support services such as housing, counseling, guidance, residential programming, training in social and cultural values, and maintenance of local address information for all undergraduate students at Hampton University. They have the authority and responsibility for all aspects of student life and welfare. 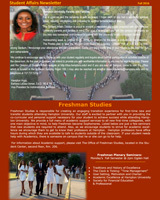 The Freshman Studies program is primarily responsible for new students. Its major objective is to provide a comprehensive core of academic support programs to facilitate the delivery of services that significantly influence the academic achievement of students. Located in the Student Center, the Office of Student Activities coordinates the co-curricular activities for students by providing information about joining campus and student organizations, coordinating Student Leadership Development Program, preparing and issuing the master and weekly calendars of events, assisting students with scheduling events, securing facilities and following University procedures for maintaining an effective program of student activities. The Health Center provides outpatient health care for the Hampton University community. Health services are provided by a staff consisting of a physician, nurse practitioners, registered nurses, medical laboratory technician, and medical office personnel who are committed to maintaining a maximum level of wellness for each member of the University community. Many students encounter a variety of personal, social, career, and academic issues that call for assistance beyond advice provided by friends and family. The Hampton University Student Counseling Center provides free and confidential services through professional counselors who are experienced in dealing with students' emotional and academic concerns. Services include private counseling, workshops, and peer support programs. This program is designed to assist participants in completing high school and enrolling in a post-secondary educational institution. ETS serves over 900 clients. Two-thirds of all clients must be low-income and potential first generation college graduates. Students are recruited from a target area that includes the cities of Hampton and Newport News, Williamsburg, Suffolk, and the Counties of Isle of Wight, and James County. The program is designed to aid students in the realization and development of their potential, self concepts and interests. It also encourages students to extend their educational training beyond the undergraduate level or to pursue a viable career. Funded by the Department of Education, Upward Bound provides fundamental support to its participants in their preparation for college entrance at no cost to the participants. Upward Bound serves high school students from low-income families; and high school students from which neither parent holds a bachelor's degree. Upward Bound gives academic instruction in math, laboratory science, composition, literature, a nd foreign language. The Intramural Sports program provides activities designed to fulfill the fitness and recreational needs of Hampton University Students, Faculty, and Staff. The program offers a wide variety of sports that include: Aerobics, Basketball, Bowling, Dodge Ball, Flag Football, Co-ed Soccer, Women’s Soccer, Volley Ball, Women’s Badminton, Sports Club, and Fitness and Wellness. The Hampton University Pre-College/Summer Bridge Program is a five-week, academic enrichment, residential program. The Pre-College/Summer Bridge Program promotes and secures an environment where students will have an opportunity to grow personally, while they enhance their academic and leadership possibilities. The Office of Testing Services at Hampton University serves as a regional test center that strives to meet the testing needs of both the University and the Peninsula/Tidewater area communities. The office administers both University and national tests. The Office of Compliance and Disability Services is committed to a policy of ensuring that no otherwise qualified individual with a disability is excluded from participation in, denied the benefits of, or subjected to discrimination in University programs or activities due to his or her disability. The University is fully committed to complying with all requirements of the Americans with Disabilities Act of 1990 (ADA) and Section 504 of the Rehabilitation Act of 1973 (Section 504) and providing equal educational opportunities to otherwise qualified students and employees with disabilities.